A D.C. Public School student uses technology to help accelerate learning. One of this year’s themes for Connected Educators Month is blended learning, and it’s not hard to understand why. With its mix of online and face-to-face (F2F) lessons, blended learning lets teachers use data to differentiate instruction and reach each child with what he or she needs. But don’t let us convince you. See what your colleagues are saying. 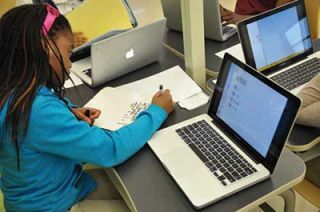 How it offers blended learning: “DCPS has a lot of different models, but all 86 elementary, middle, and high schools have some level of blended learning going on,” says David Rose, deputy chief, educational technology and library media services. Kramer Middle School uses a rotational model in which students shift between teacher-led instruction and online lessons delivered through laptops. Randle Highlands Elementary also uses a rotational model, but it’s been tweaked to include independent learning stations that use more traditional analog tasks and desktop computers that feature hand-selected educational software. At Hart Middle School, all students use Teach to One: Math. Ranson IB Middle Schoolers put care into their online work. How it offers blended learning: “We started three years ago and have gone through a number of changes,” says Alison Harris, principal. “Today, we have Google Chromebooks and HP desktops. Students do lab rotation and in-class rotation.” For lab rotation, students get pulled from class to go the computer lab for accelerated learning or remediation, depending on what the data says they need. In class, half the students may be doing small-group work with the teacher while the other half are on computers doing blended assignments for acceleration or remediation. Harris says the school has focused on math but will branch out to science this academic year. Blended tools: Compass Learning Odyssey is the foundational tool, but teachers sometimes create their own video content. Why blended? “When I came here in 2011, the data showed that only about 50% of our scholars were meeting or exceeding growth expectations. We needed to catch them up and provide them with the content and skills,” says Harris. She knew that differentiating instruction would better serve her students, since direct instruction wasn’t working. “Blended allows us, through data-driven instruction, to reflect upon what they need right now to move forward in their learning. Blended [learning] is proving to be a great choice.” In 2012-13, the 6th-grade science classes had the highest growth in the district. Math in all three grades experienced the fourth-highest growth, and the school was ninth out of 156 schools in total growth. Steve Thompson enjoys face time with a student at Impact Academy. How it offers blended learning: At Impact Academy, students choose their own mode of learning. Students can select a purely online environment or come in two days a week for F2F lessons. “We intentionally set up our program so that students can reach competency at their own pace and work any time or at any place they need to work, even if it means meeting a teacher at Starbucks on a Saturday,” says Steve Thompson, program administrator. Edgenuity is the content provider, but students can come up with a project if they feel it will allow them to demonstrate their learning. A third option is to attend a direct instruction class from teachers who deliver high-interest, high-energy lessons. Blended tools: Edgenuity is the main content provider, but some courses are augmented with eDynamic Learning. How it offers blended learning: The district uses a rotational model. Students do a mini lesson and break into small-group instruction that includes independent work, digital stations, or a teacher-led session. The district started its blended program in December 2012 after receiving a $20 million dollar Race to the Top grant. They partnered with Education Elements and teachers opted-in to receive training and tools. In August 2013, 33 teachers started blended classrooms. This September, 120 teachers at four elementary schools were on board. Amy Creeden, principal of the district’s Race to the Top grant, believes that the initiative is as successful as it is because of teacher commitment and the support of the technology integration specialists. “The collaborative relationship between the team [members] created a strong teacher feedback loop and ongoing tech support and coaching,” she says. Middletown elementary students enjoy group work on their laptops. Grades involved: Now available for K-5 grades. The program will be expanding to 6th, 7th, and 8th-grade math and English language arts this school year. Why blended? At Middletown, where 76% of the students receive free or reduced-priced lunch, students were moving on without reaching proficiency. “We knew we had to provide each student with a personalized learning path. That required teachers to set goals for each student. Digital content helped the teachers to provide prescriptive instruction to support skill gaps,” says Creeden. “Blended [learning] allows a teacher with 25 students at all different reading and math levels to set targeted events and goals for each student.” Students in blended reading classrooms on average exceeded their NWEA growth expectations by 50% (growing 1.5 years in a single year). Students in blended math classrooms on average exceeded the NWEA expected growth by 21% (growing 1.21 years in a single year). Students in blended classrooms outperformed students in non-blended classrooms by 57% in reading and 26% in math. Sheryl Place enjoys coming up with new ways to teach that resonate with her students. Place’s students combine online learning with face-to-face for positive results. Sheryl Place, an ELL teacher at Miami Killian Senior High in Miami, Florida, offers these five tips for flipping your classroom. • Make a DIY video. It’s quick, fun, and easy to do. It doesn’t have to be professional—just create something that will interest your students and increase the potential for learning. I ’m not suggesting you create a video lecture. I’m talking about a demonstration or a brief “how to.” Try using my favorite tool, Jing, at www.techsmith.com/jing.html. • Find a space where you can communicate with students. If they have a question, where will they seek assistance? Edmodo (www.edmodo.com) is a wonderful option. • Hold your students accountable for their learning. Do you have a student who never participates or hides in the back of the room? With blended learning, every student must participate in the activity to be an active participant in the class. Students learn in the manner that best suits them, at their own pace, and perhaps even follow their own learning path. My favorite activity: Create an entrance ticket with one question that students must answer upon arrival to class. • Follow up with engaging classroom activities. Students need to see the purpose in their home learning. By being the coach or facilitator in class rather than the wise one in front of your students, you now have more time for interactive activities, labs, learning games, and long-term projects demonstrating mastery of concepts. Engaged students are happier students. • Stick with it. Any new method is trying and challenging. You may feel pushback from both students and parents. Don’t give up. Once you have established a plan that fits your needs, you will be off and running. Create a community of learners through your SMS/LMS and engage everyone in discussions, providing feedback, and questions. In the late 1990s, the parents of a special needs student in Tucson, Arizona were dissatisfied with traditional schooling. Fortunately, they had extensive educational expertise. They founded Mountain Rose Academy, a charter high school featuring an individualized, self-paced, computerized program for each student. On day one, they set up a card table in front of the school. Each student got a desktop computer and also participated in small-group instruction. They were expecting 40 students, but more than 100 students seeking an alternative to traditional education enrolled. Since that time, the Rose Academy has expanded into four schools that serve 1,200 students. From the start, our teachers were pioneers in blended learning, combining computer-based instruction with individual and small- group instruction. One of our challenges was to find a rigorous electronic curriculum with an appealing look and feel that offered a variety of course options and met state standards. Originally, Rose spent time and energy developing its own computerized curriculum; however, the use of our time was best served in helping teachers implement a blended instructional model. So, in 2013, we began to look for software that would match our system of education. After thorough evaluation, we selected OdysseyWare. Our students find the new curriculum appealing, yet challenging. Implementing OdysseyWare curriculum has allowed us to focus our time and energy on instruction rather than developing curriculum. Our instructional approach focuses on teaching students how to learn and how to perform. Teachers emphasize teaching strategies so that our students can meet academic demands. Our teachers are coaches. We educate students “how to fish” so that they can become independent lifelong learners. We, as well as our students, are well prepared to incorporate any future innovation because our system demonstrates a step beyond competence. Kelly Hurtado is superintendent at Rose Academies, public charter high schools that have been serving the Tucson community for more than 15 years.